A free pdf book on Canadian Genarals in the First World War, edited by Major Andrew B. Godefroy, PhD. Kingston: Canadian Defence Academy Press, 2010. From popular literature to reprinted memoirs and new media, over the last decade military historians have taken a renewed interest in Canada's role in the First World War. In particular, their attention has focused greatly on the Canadian Expeditionary Force (CEF) and its decisively lethal Canadian Corps, an ably-led and well-supported combat formation that was often unmatched for success on the western front. As the hammer of the British Army, the Canadian Corps soon earned the title "shock troops" and was often referred to as the "tip of the spear" in the Entente drive towards final victory on the western front. By the end of the war, over a half million men and women had served in the CEF and the Canadian Corps. Sadly, 64,944 of them never returned home. Examinations of military organizations cannot be considered complete without some consideration for those who lead, shape, and guide them through both war and peace. Yet, despite the renewed attention on the Canadian Corps itself, the study of those who commanded this juggernaut at the highest levels remains much less well defined than the mass of men and women who filled its ranks. This is somewhat odd given that there exist many detailed political, social, operational, and tactical studies on theca, and begs one to ask how historians have assessed the movements and actions of the body of the Canadian Corps without developed understanding of what was going on in the mind of this titan as it did so. 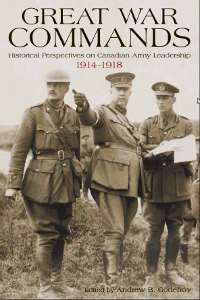 Great War Commands: Historical Perspectives on Canadian Army Leadership, 1914-1918, brings together Canada's leading military historians of the First World War to conduct the first ever in-depth study of the senior leadership of the CEF. Although by no means exhaustive, this book presents major contribution to broadening the current understanding of how the CEF was led and why it performed as it did both at home and on the battlefields of the western front. Brigadier-General F.O.W. Loomis and the Question of "Impersonal Generalship"